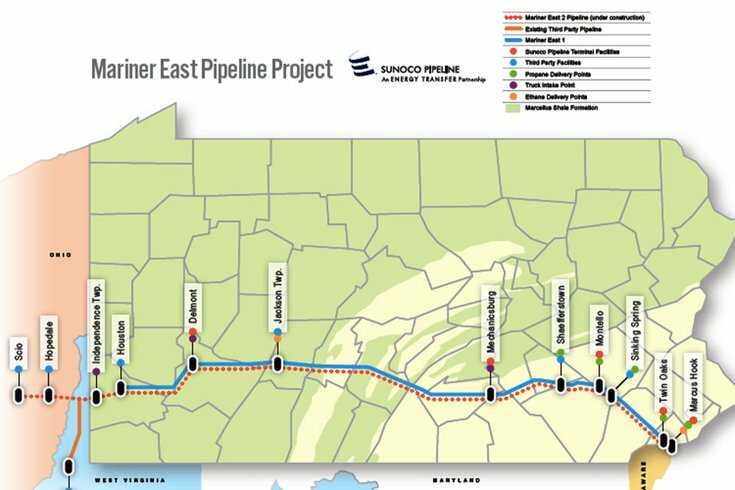 The Mariner East 2 pipeline would bring natural gas from western Pennsylvania to a terminal in Marcus Hook, Delaware County. Pennsylvania’s Department of Environmental Protection announced Friday it has halted construction permits for Energy Transfer, the company behind the contentious Mariner East 2 pipeline in southern Pennsylvania. Energy Transfer's Revolution pipeline exploded in western Pennsylvania last September, destroying a home and a number of cars. At the time, Pennsylvania lawmakers called for the company to halt construction on Mariner East 2. It remained under construction and began service at the end of 2018. Elsewhere in September, a 12-inch pipeline operated by Sunoco, which merged with Energy Transfer in 2017, leaked 33,000 gallons of gasoline into Darby Creek near Philadelphia International Airport. And last month, a sinkhole opened at an old Mariner East 1 pipeline site in Chester County. Gov. Tom Wolf said in a statement that Energy Transfer had failed to respect the state’s laws and communities. Energy Transfers currently has 27 permit approvals under review by the DEP, according to the governor’s office. The currently out-of-use Revolution pipeline will also remain closed until compliance has been achieved by Energy Transfer. According to the Associated Press, the DEP said Energy Transfer has failed to stabilize the soil and erosion around the western Pennsylvania pipeline. The company was ordered to stabilize the soil and erosion back in October. Between May 2017 and November 2018, two of Energy Transfer’s pipelines in Pennsylvania and Ohio — including the Mariner East 2 — racked up more than 800 state and federal violations, according to the Digital Journal. Energy Transfer said in a statement that it will bring its pipelines “into full compliance” with the state’s environmental regulations.